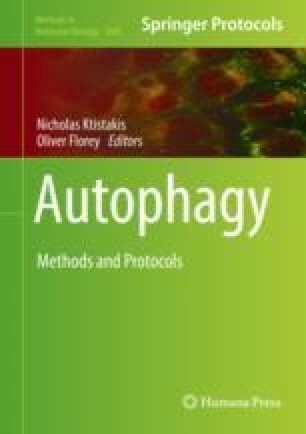 Autophagy is an important cellular process in which cell components are degraded in a controlled way and their building blocks are recycled into new macromolecules. Autophagy starts within a double-membrane container, the autophagosome, itself the result of a number of interconversions of cell membranous elements. In our recent work, we have described reconstituted model systems for the interactions of autophagy proteins with membrane lipid bilayers and for the autophagy protein-mediated vesicle tethering and fusion, with the aim of ultimately reconstituting the autophagosome formation. The present chapter describes in detail (a) the steps required for the preparation of semisynthetic lipid vesicles (liposomes), including giant unilamellar vesicles, (b) ultracentrifugation and fluorescence methods for assaying protein binding to membranes, and (c) procedures for assessing vesicle–vesicle aggregation and fusion. The latter include methods for intervesicular total lipid mixing, mixing of lipids in the vesicle inner monolayers, and aqueous contents mixing. Javier H. Hervás and Zuriñe Antón contributed equally to this work. The authors thank Ms. Araceli Marcos for her technical support. This work was supported in part by grants from FEDER/Spanish Ministry of Economy (BFU 2011-28566, BFU 2015-66306-P) and the Basque Government (IT838-13). J.H.H. and Z.A. were predoctoral fellows supported by the University of the Basque Country; J.H.H. is a postdoctoral fellow supported by the University of the Basque Country, and Z.A. is a postdoctoral research associate supported by BrisSynBio at the University of Bristol.